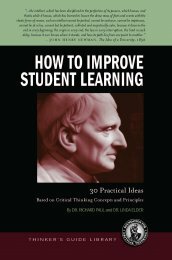 Provides 30 practical ideas for the improvement of instruction based on Critical Thinking Concepts and Tools. It builds on and goes beyond, the ideas in the mini-guide Active and Cooperative Learning. It cultivates student learning encouraged in the How to Study and Learn mini-guide. This guide presents 30 instructional ideas based on the goal of teaching all subjects so that, as a consequence, students take ownership of the most basic principles and concepts of the subject. Most of our suggestions represent possible teaching strategies. They are based on a vision of instruction implied by critical thinking and an analysis of the weaknesses typically found in most traditional didactic lecture/quiz/test formats of instruction. Students should master fundamental concepts and principles before they attempt to learn more advanced concepts. If class time is focused on helping students perform well on these foundational activities, we feel confident that the goals of most instruction will be achieved. Our goal is not to dictate to you, but to provide you with possible strategies with which to experiment. The specific suggestions we recommend represent methods and strategies we have developed and tested with our students. Judge for yourself their plausibility. Test them for their practicality. Those that work (i.e., improve instruction) keep; those that do not work, abandon or redesign.